I’m thrilled to report that at the gala event held on October 30, 2013 at the Seaport Hotel in Boston, Leslie Fine Interiors, Inc. was the recipient of the coveted Gold PRISM Award from the Builders and Remodelers Association of Greater Boston for BEST BATHROOM! The clients desired a “spa-like” bathroom with an extra large shower with a two sided set up using two shower heads, two rain heads and multiple body sprays and a long bench for sitting on and relaxing. Furthermore, they wanted plenty of vanity storage and countertop space with two sinks and a separate makeup area. To keep the bathroom light, bright and airy, I used large white tiles for the floor and bright white vanities and countertops. 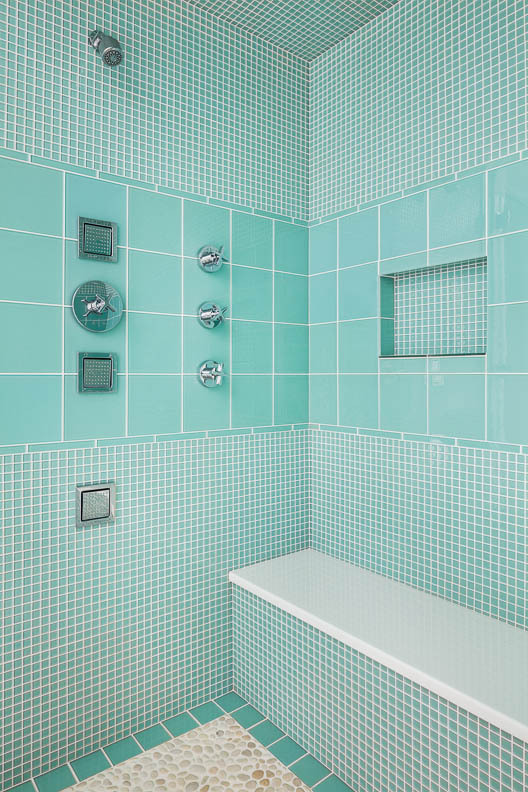 The spa-like green glass tiles were used halfway up the walls of the bathroom and on the shower walls. River stone was used on the shower floor (so many of my clients love the feel of this material under their feet). 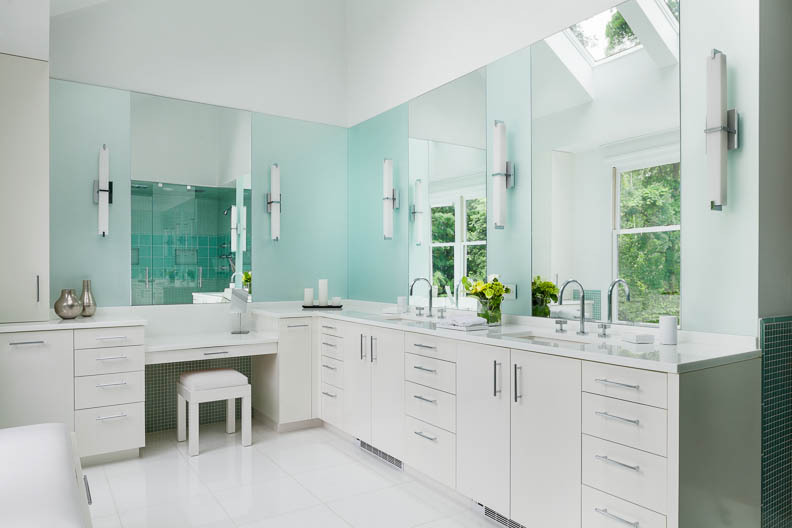 With chrome plumbing fixtures and sconces, the vanity area was topped off using a combination of mirrors and sandblasted glass. I am thrilled to add this 2013 PRISM Award to many other PRISM awards that I have received in past years. I love designing luxury bathroom spaces as there are so many materials and fixtures available to incorporate into an aesthetically pleasing and functional space. Design by Leslie Fine Interiors, Inc.
Are you thinking about renovating a bathroom in your home? Call Leslie Fine Interiors, Inc. at 617-236-2286 to make your vision a reality! Check out our portfolio for other bathing beauties!